Come stay in Chinook, the honeymoon cabin, with your honey! This cabin is perfect for couples looking to get away from reality. Chinook's deck faces the Wallowa River, and the forest-covered mountains above and beyond the river. You can cozy up in the evenings with the Gas fireplace going and enjoying the view. It also has a charcoal BBQ for your enjoyment which is nice for summer evenings! 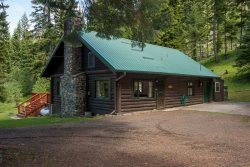 This cabin is located on the Flying Arrow Resort property and is close to cabins 101-112, Minnow, Fawn, and the Nez Perce cabin, so multiple families could stay in the same area close by. This cabin is also close to hiking trails, restaurants, and more! Come to this adorable cabin with your loved one and explore the Eagle Cap Wilderness! Absolutely wonderful. We'll be back every year!